The New Batch of Journey Companions from Cagayan de Oro City together with the NCAF and XU organizers. 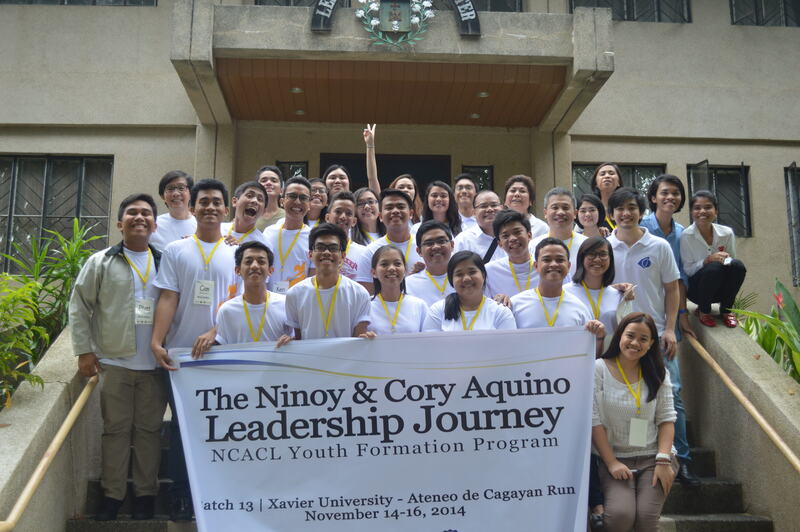 The Ninoy & Cory Aquino Leadership Journey (NCALJ) Community welcomed the 13th Batch of Companions in Cagayan de Oro (CDO) City last November 14 to 16, 2014. Nineteen student leaders from Xavier University – Ateneo de Cagayan (XU-ADC) participated in the 3-day Leadership Journey. The three days were devoted to introducing the participants to NCAF’s core value of spiritual leadership, which is rooted in the belief that to be a good leader is to lead in response to love. Speakers, both from CDO and Manila, shared with the participants about their own experiences of God’s love, the call for each one to love back, and the invitation to serve others. XU-ADC President, Fr. Robert Yap, SJ, opened the program by talking about the people’s yearning for heroes. Fr. Yap went to reiterate that this yearning was not a search for iconic leaders, as Ninoy and Cory Aquino were, but rather to respond to their call for us to find heroes within. Ms. Richel Petalcurin, and Ms. Mona Pangan, from XU-ADC, Mr. Ryan Casiño of Dire Husi, and Damulog, Bukidnon Mayor Romy Tiongco graced the Leadership Retreat as Program Speakers who shared about their own journey in responding to the call to serve others. Philosophy Professor Eduardo Calasanz, and Mr. Niko Capucion completed the roster of Program Speakers. NCAF President and Executive Director, Mr. Rafael Lopa, expressed his gratitude to XU-ADC for believing in the mission of NCALJ. “We are happy that XU-ADC entrusted us to bring this Leadership Program to the youth in CDO. This is the first time that we are doing the NCA Leadership Journey in CDO and we hope that this is just the start,” Mr. Lopa adds. One of the participants, Francis Luis Urbina, shared that, through the NCAF Leadership Journey, he realized that “leaders are not perfect human beings, yet God loves [us] even though [we] are not perfect, and leadership is about loving God back.” Ramil Haos Jr., said, “I learned that genuine leadership is deeply rooted in faith. Service springs forth from [the] love and care [we receive] from God and others.” Ramil continued by saying that he will “continue the NCAF mission” in his life. Read more of their testimonials by clicking here. The Ninoy & Cory Aquino Foundation (NCAF) traces its roots to the Benigno S. Aquino, Jr. Foundation (BSAF), established by the late Senator’s widow in November 1983 to perpetuate his legacy. It seeks to build on the legacy of Ninoy and Cory Aquino by supporting activities that embody the spirit of People Power as a strong and positive force for social change in a robust democracy. Since 2008, the Foundation has made a deliberate effort to strengthen this advocacy through leadership formation development. Xavier University – Ateneo de Cagayan is a private, Catholic university run by the Society of Jesus in Cagayan de Oro, Mindanao. Founded on June 7, 1933 by an American Jesuit missionary named Fr. James T. G. Hayes, SJ, Ateneo de Cagayan became a university in 1958 and was renamed to its present name in honor of the Jesuit missionary, St. Francis Xavier. Xavier University is known to be the first University in Mindanao and also the first Jesuit University in the Philippines. Presently, Xavier houses four campuses: Agriculture extension at Manresa, the High School and Grade School Annex in Pueblo de Oro, the Grade School campus in Macasandig, and the main Tertiary campus in Divisoria. The Tertiary Campus includes the schools of Business and Management, Education, Arts and Sciences, Nursing, Engineering, Agriculture, and Computer Studies. Xavier has a Graduate School and Professional schools of Law and Medicine.